Hobie Forums • View topic - What difference of i-SERIES and std sail kit? Post subject: What difference of i-SERIES and std sail kit? I am a new i12s user, because I bought the wrong sail kit from overseas and can not be returned. So I want to know what difference of i-SERIES and std sail kit? And why the std is does not work with the inflatable Hobie kayaks? Can I DIY a mast receiver for install the Std sail kit to i12s? or I need to buy the "79052251 4-PIECE (i-SERIES) MAST" replacement to replace the Std sail kit mast? Post subject: Re: What difference of i-SERIES and std sail kit? Hi Jbernier, Many thanks for your reply. you are so helpful to me. I should add the below webbing tab to tie the lines for hold up the sail? If I can solve this problem, theoretically it still can be used the std sail kit in my i12s? The reasons they are not interchangeable are because both the sail and mast are slightly different. The regular sail mast drops in a receiver and is supported entirely by that receiver. The inflatable series mast, as jbernier says, is supported by 2 shrouds and a forestay (lines) that attach the sail to the boat and position the mast instead of a receiver. Therefore, the inflatable kit has a shorter mast and the shrouds sewn attached to the sail. Your best bet is to use the correct kit and either sell or trade in your current kit. Alternatively, you might be able to rig 3 lines to the top of the sail (the original lines are rigged a little lower at the front of the sail) with hooks to snap into the padeyes. Your longer mast probably is not critical to sail operation. Magnify and study the pics in the following link to see how this is rigged. I bet your "wrong" sail doesn't have the bungee downhaul to tension the bottom front (sail "tack") down to the hook on the i12s mast base. Not essential, but it helps shape the sail and hold the mast on when a shroud goes slack. Another difference with the i-sail is that possibly it has a more aerodynamic 3d cut vs the other one flat to be roller furlable. Unfortunately, speculation sometimes gets confused with fact and can be misleading. I bet your "wrong" sail doesn't have the bungee downhaul to tension the bottom front (sail "tack") down to the hook on the i12s mast base. Another difference with the i-sail is that possibly it has a more aerodynamic 3d cut vs the other one flat to be roller furlable. Sorry, I am used to the inflatable kayaks (non i11s) getting little attention from you experts, but if you-all are here to stay, I guess there is little need for amateur speculation. 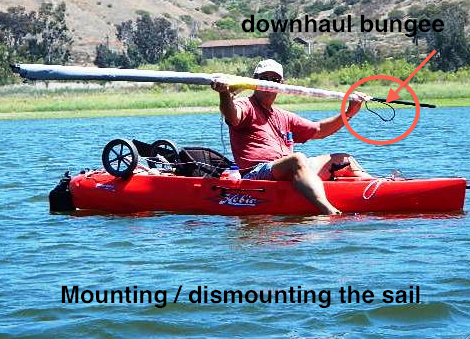 It IS amazing that Hobie could devise a downhaul that doesn't interfere with roller furling. For the belly cut sail speculation I had suggestive evidence from a Hobie post which I cannot now rediscover. So I will defer to your expertise, except cannot digest your earlier claim that a rudder can be sawed shorter with NO loss of rudder authority. In an i12s with large sailing rudder in wave disturbances, rudder authority is what you want more of, and deeper should mean less disturbed water to bite. Esp with waves on the stern and on the brink of broaching. But maybe an i11s hull shape would be best remedy for 3+ foot breaking windwaves without broaching. 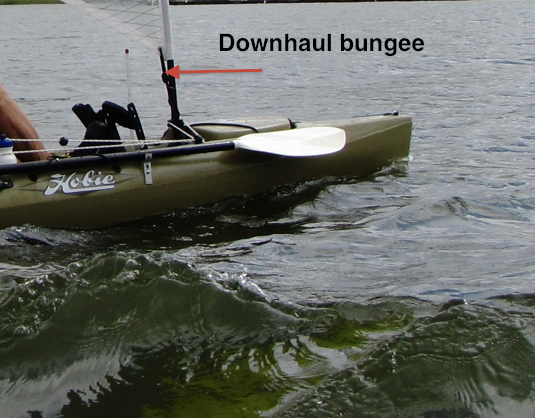 It IS amazing that Hobie could devise a downhaul that doesn't interfere with roller furling. They're pretty amazing guys -- they rigged it so you just attach the downhaul to the furler disk so that everything rotates together. ...cannot digest your earlier claim that a rudder can be sawed shorter with NO loss of rudder authority. ...this one is infuriating and tempts me to fall back to nonturbo fins and small rudder! I built it to make sure my advice was valid and ended up liking it so much that I use it all the time. It might be useful on an inflatable -- haven't tried it. BTW, your comments that are actually based on your experience are generally excellent and I enjoy reading them! Thank you all expert advice on this, it is really very helpful to me. I hope that I can successfully convert the std sail kit to my i12s.